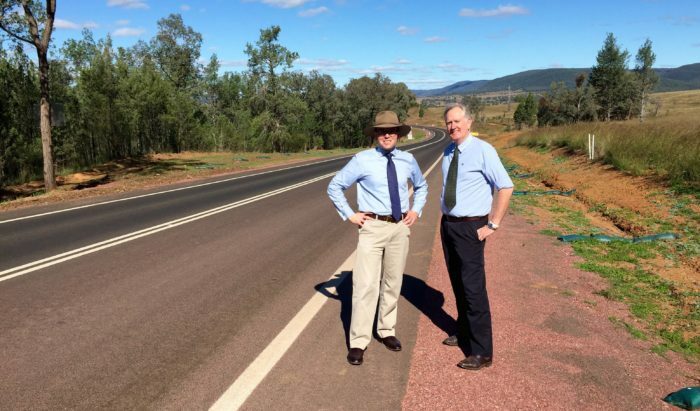 Northern Tablelands MP Adam Marshall, left, pictured with Gwydir Shire Council’s Technical Services Director Richard Jane on the recently-completed Fossickers Way upgrade works north on Bingara. NORTHERN Tablelands MP Adam Marshall has commended Gwydir Shire Council on successfully completing a major upgrade of the Fossickers Way, north of Bingara. Mr Marshall said the $2.6 million project, which council undertook on behalf of the State Government, involved the replacement of a 3.3 kilometre section of Fossickers Way between Bingara and the Delungra Road turnoff. “Gwydir Shire has done a great job, completing work on budget and on time, and delivering a quality road surface which has improved safety on this busy stretch of Fossickers Way,” Mr Marshall said. Mr Marshall inspected the completed work recently with council to see the final line markings being made. “I’m very pleased to see this section of Fossickers Way upgraded and will continue to lobby for further funds to be spent improving this important route in the region,” he said. Mr Marshall said he was delighted that his lobbying on behalf of the council and community had been recognised in the recent State Budget, which allocated further funding to upgrade Fossickers Way and some local bridges along the route. “It’s shaping up to be another very busy time for council with almost $6 million allocated in the budget for road and bridge works in the Gwydir Shire this year,” he said. $800,000 to upgrade Cobbadah Creek Bridge on Fossickers Way.